Although most habit-forming drugs result in addiction, and therefore withdrawal symptoms, of all these chemicals only two can be deadly upon the cessation of the substance: benzodiazepines and alcohol. Delirium tremens (DTs) refers specifically to the severe symptoms that occur as a result of withdrawal from alcohol. Here’s a look at the causes, symptoms, and treatment of DTs. While delirium tremens is caused by alcohol withdrawal, it does not happen to anyone who just has a few beers. DTs is largely specific to people with a history of alcohol abuse, engaging in copious amounts of alcohol intake over fairly long periods of time. For example, while you might not suffer from delirium tremens after a weekend of heavy drinking, several months of imbibing the equivalent of a pint of hard liquor daily may incite DTs. Individuals with at least approximately a 10-year history of alcoholism are also at risk of delirium tremens if they quit without reducing their daily intake or by reducing daily intake too rapidly or severely. DTs may also be brought on by not eating while drinking excessively or as a result of an injury or illness in tandem with alcoholism. The symptoms of delirium tremens generally occur within 2-4 days after your last consumption of alcohol. However, the National Institute of Health reports that it can take more than a week (up to 10 days) after the cessation of consumption for DTs to appear. It can take some time for the chemicals in alcohol that the body comes to rely on to leave the system sufficiently to incite the extreme physical and neurological withdrawal symptoms of delirium tremens. Approximately half of all alcoholics will experience some form of withdrawal upon cessation; up to 5% may experience symptoms as severe as seizures. There is a wide range of delirium tremens symptoms. 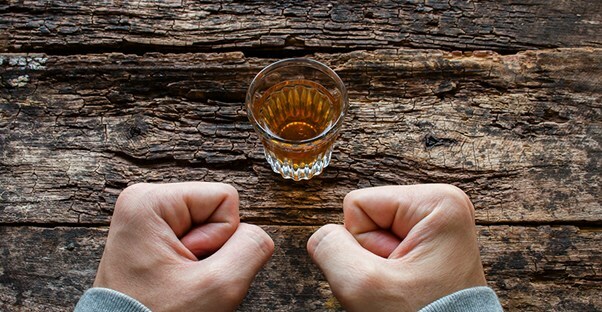 Alcohol withdrawal may affect the mood, causing mood changes or extremities of emotion (e.g. irritation or excitability). The gastrointestinal system may be affected, causing diarrhea or vomiting. Cognitive symptoms, such as confusion, hallucinations, sensory sensitivity, or sleep interruption, may appear on a range of severity (for example, you may experience insomnia, or you may sleep deeply for an abnormally long time). Unconscious functions of the body may be affected; you may notice body tremors or shakiness, loss of appetite, palpitations of the heart, fever, and/or excessive sweating. Other symptoms not listed here may also appear, as nearly every system of the body becomes overwhelmed. Delirium tremens is a medical emergency and can be fatal. If you or someone you love are experiencing DTs, get to an emergency room immediately. The goal of treatment for delirium tremens is to stabilize the individual by getting symptoms to decline while circumventing any avoidable complications. Immediate treatment may involve intravenous fluids and medication to control symptoms (whether mental, physical, or neurological). This may involve sedating the patient until the worst of the symptoms have passed. Once the patient is secure and through the worst of the symptoms, more long-term treatment goals can begin. This generally involves encouraging the patient to engage in abstinence from alcohol, often by taking part in support groups such as Alcoholics Anonymous or going to therapeutic counseling. At the very least, an extended “drying out” period involving absolutely no alcohol intake for a designated period of time will be recommended. Physically, your medical team may take steps to diagnose and begin treatment of any alcohol-related problems, such as liver diseases, alcoholic cardiomyopathy, digestive concerns, neurological issues, immune system complications, and the variety of other problems that can present as a result of extended alcohol abuse. If you or someone you love is attempting to quit drinking, talk to a doctor or treatment center about the safest way to begin abstinence.